Kuldeep Yadav’s hat-trick and an exceptional performance by the bowling unit helped India register a 50-run win over Australia in the second ODI in Kolkata. Earlier, Virat Kohli (92) and Ajinkya Rahane (55) put India in complete control before Australia fought back to restrict the hosts to just 252. Brief scores: India 252/10 (Virat Kohli 92, Ajinkya Rahane 55; Nathan Coulter-Nile 3/51, Kane Richardson 3/55) beat Australia 202/10 (Steve Smith 59, Marcus Stoinis 62*; Kuldeep Yadav 3/54, Bhuvneshwar Kumar 3/9) by 50 runs. India won the toss and Virat Kohli opted to bat first with an unchanged team. Playing his 100th ODI, Steve Smith made two changes in his team with Kane Richardson and Ashton Agar replacing James Faulkner and Adam Zampa. Ajinkya Rahane and Rohit Sharma opened the Indian innings and got their team off to a slow start finding the first boundary in the third over. In the next over, however, they managed to cross the fence a couple of more times before Nathan Coulter-Nile sent Sharma back to the hut by catching the ball, on the second attempt, off his own bowling. Over the next 24 balls, India added another 18 runs to take the score to 44/1 at the end of the first powerplay. Rahane, along with Kohli, started building a much-needed partnership for India after the early losses and managed to take India to 77/1 after 16 overs and by the 23rd over, both players had crossed the fifty run mark. It was a mistake, running between the wickets, that got Smith the breakthrough that he desperately needed. Rahane was slow on the turn for a second run and failed to make his crease as Wade took the bails off from a perfect Hilton Cartwright throw. By the end of the 25th over, India had scored a sub-par 124 with the loss of two wickets. Manish Pandey’s stay at the crease was a short one as Agar sent him to pavilion in the 28th over for a score of three. India crossed the 150-run mark in the 31st over and Kedar Jadhav and Kohli started rebuilding the innings. Jadhav decided to go on the offence as he smashed Agar for two back to back boundaries before hitting Stoinis for a maximum in the very next over, taking the score to 185/3 after 35 overs. However, Coulter-Nile’s return to the attack bore instant rewards as Jadhav found the palms of Glenn Maxwell at the backward point to end his innings at 24 off as many balls. One of the heroes of the last game, MS Dhoni came to the crease and a couple of overs later his partner in crime from the Chennai game joined him as the Indian skipper fell short of his century by eight runs when he was cleaned up by Coulter-Nile. With about 12 overs to go, India looked set to get a good score on the board but Australia were not ready to give up without a fight. Dhoni’s tame drive found Smith at short extra cover and all of a sudden Australia looked in control. Over the next seven overs, Pandya, along with Bhuvneshwar Kumar, managed to score just 26 runs. With under three overs to go, rain interrupted play and when the players walked back out, Australia tightened the noose with Richardson getting rid of Kumar before Pat Cummins sent Kuldeep Yadav packing. Richardson was handed the ball for the last over and in-spite of the pacer dismissing the two remaining batsmen, India’s managed to set Australia a competitive target of 253. Australia decided to stick with the same opening partnership, Hilton Cartwright and David Warner, but yet again the duo failed to give the visitors a good start as the former was bowled by Kumar in the second over. On the other end, Bumrah conceded seven runs in the next over but Kumar was bowling one of the best spells of the series so far and capped it off with the important wicket of Warner which meant that Australia could only muster 10 runs in the first five overs. However, Bumrah conceded 12 runs in the very next over and before Smith and Head targeted him again in his next taking the same amount of runs again. By end the first powerplay, Australia had managed to put up 47 runs on the board. Smith and Head then started to put pressure on the Indian bowlers taking 33 runs off the next six overs. Just as it looked like Australia were going to run away with the game, Head it a Chahal full toss straight down the throat of Manish Pandey at midwicket. The incoming Maxwell picked Yadav as his target, as he sent his two back to back deliveries over the ropes which took the Australian score to 102/3 at the 20th over mark. However, Chahal exacted some revenge for his spin partner by getting Maxwell stumped in the 23rd over. At the halfway point of their innings, Australia had managed to reach a score of 120/4. With 25 overs to go, Australia were in a comfortable position needing just 133 runs to level. Smith brought up his half-century as the Australian score reached 133/3 after 29 overs. Pandya finally got India the much-needed breakthrough when Smith’s attempted pull shot could only reach substitute Ravindra Jadeja. Even with their captain back in the dressing room, Australia looked favorites with just 115 runs needed with five wickets in hand in 120 balls. 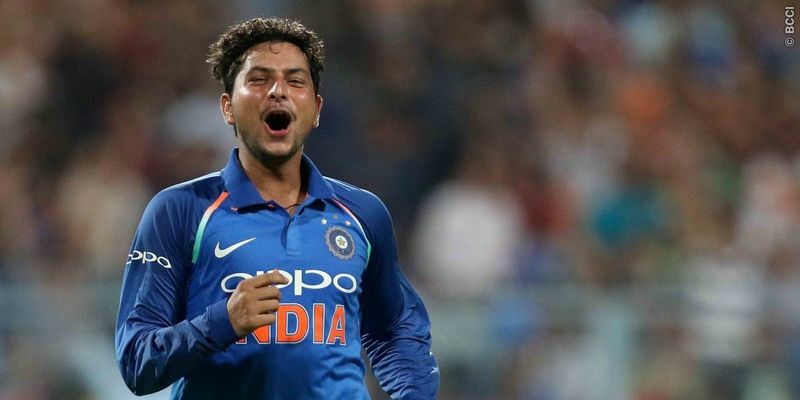 Australia’s hope faded away quickly though as Kuldeep became only the third Indian player to get an ODI hat-trick as he dismissed Wade, Agar, and Cummins on consecutive deliveries to leave Australia reeling at 148/8 with 17 overs to go. Stoinis, however, kept playing his shots, taking the score to 181/8 in 39 overs. But just as Australia looked like they might have something more to offer, Pandya dismissed Coulter-Nile’s in the 40th over to make the result almost certain. Stoinis completed his half-century with a maximum of a Pandya delivery but he was at the non-striker’s end when Kumar, finally ended the Australian innings, catching Richardson plumb in front of his stumps. The result means that India just need one more win to secure the ODI series after winning the Border-Gavaskar series earlier this year.